Dollar General Cashier with the GOLDEN VOICE! 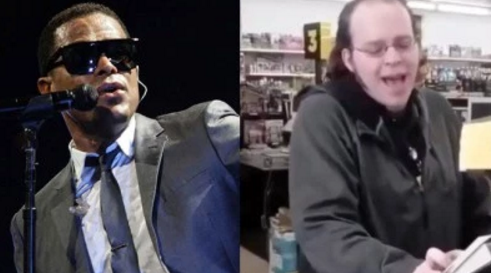 A Dollar General cashier from Lansing, Michigan, is reaping the rewards for singing while he works. Lucas Holliday was caught on camera singing Maxwell’s “Ascension” while checking out a customer, and the video has nearly a whopping 500 million views. Today he received the surprise of a lifetime on “Good Morning America,” with a personal message from Maxwell inviting him on stage to perform with him at his Detroit concert on Friday night. An overwhelmed Holliday was shocked by the offer, covering his mouth with both hands in disbelief. “Please, yes, please, please, please, lord please,” the 26-year-old mustered out after the news began to sink in.